1909-11 T206 Sweet Caporal 350/30 Eddie Plank PSA NM 7 - Pop Three, One Higher. 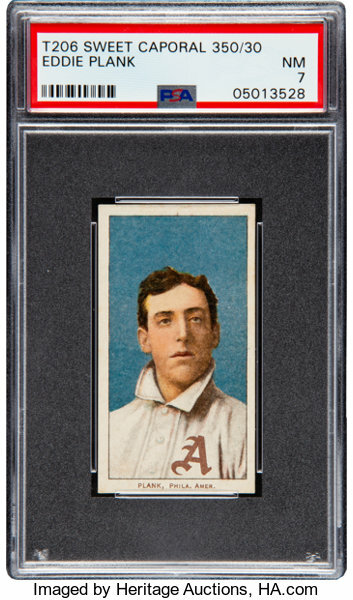 The other Hall of Fame "Holy Grail" of the hobby's most popular tobacco card issue, Gettysburg Eddie shares with the fabled Honus Wagner both a maddening elusiveness and an apocryphal tale accounting for his rarity. While the Old Dutchman is said to have demanded withdrawal of his image from the card set based upon the noble objective that he play no role in the encouragement of youth smoking, the leading theory for Plank's short print involves a broken printing plate that ended production of his card shortly after it began. These issues remain a point of debate over a century later, but there is full consensus that this pair of Dead Ball Era icons rate among the most important and desirable entries in the Standard Guide. The issue finds both Plank and the Philadelphia Athletics team he represented at the height of their collective powers, with the elite southpaw posting a 1.96 ERA over the three-year (1909-11) production span, leading the White Elephants to a pair of World Championships (1910-11). His portrait, a colorized version of celebrated photographer Carl Horner's studio shot, suggests a serene confidence, and the card itself likewise earns every point of its elite rating, boasting bold, glorious colors, sharp registration, clear surfaces and only the faintest hint of wear at the corners. This spectacular representation is one of just three assessed at the PSA NM 7 level, a rating exceeded just a single time. 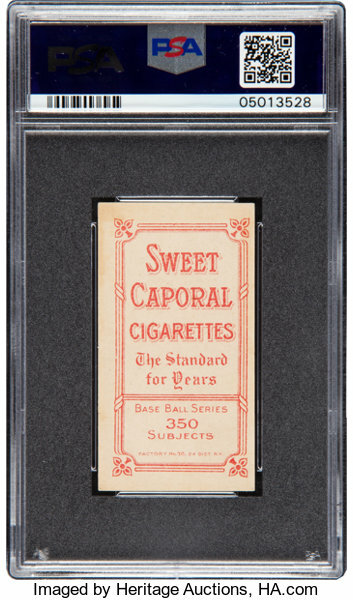 The combination of the supreme rarity of the Plank, and its extraordinary condition here, establishes this specimen as one of the most desirable trading cards in the entirety of the tobacco subgenre.